Here’s a neat little technique you can use to get year-over-year comparisons in one query with the Google Analytics Pro connector from Analytics Edge. There are some limitations, but it can make it a lot easier to create quick reports for smaller sites. 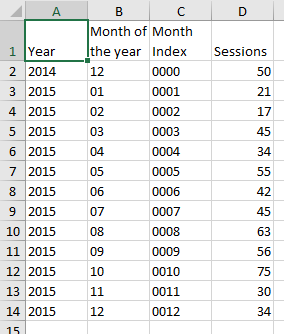 The trick uses a little-known dimension in the API: Month Index. Used with, or instead of, the Month of the Year dimensions, this index always shows the first month in the report as ‘0000’, then ‘0001’, ‘0002’, and so on. Its purpose was to make it easier to build trend charts that span multiple years but didn’t need a timeline on the x-axis, like in sparklines charts. If you make your query span 13 months, ending at the end of last month, then last month would show as ‘0012’, and the same month in the previous year would be ‘0000’. If you filter the query for these two Month Index values (matching regex ‘0000|0012’), then all the other months would show 0. If you REMOVE the Month Index and Month of the Year dimensions, you are left with just the Year, and the two monthly values! 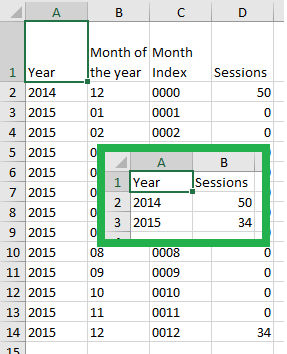 One query comparing last month’s metrics to the same month last year. Now we can take this one steps further, and add another dimension, like Default Channel Grouping, to our query and then Pivoting by the Year. You can get everything ordered properly by sorting the query by Year ascending, then your metric descending. This makes sure that the previous year is shown at the left, and the channel with the larger values are shown first. This technique relies on a query that spans 13 months, so if your website has about 40,000 sessions per month or more, the query would involve over 500,000 sessions and Google Analytics sampling would become a concern. If this is the case, I suggest you do it the hard way, with separate queries for greater accuracy. This entry was posted in Google Analytics on 2016/01/12 by articles.